The debate on the best Roomba models is majorly around the Roomba 960 vs 980. But still, the 890 has refused to bow down and still give the two a run for their money for one reason; it’s very affordable. That said, it is very difficult for homeowners to make a choice when shopping for these Roombas. 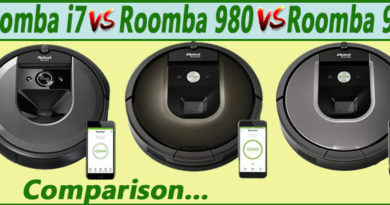 Roomba 980 vs 960 vs 890 Comparison: Who’s the Winner? Having used the three in my two bedroom apartment, I decided to write this review to help would be buyers know the differences and what each Roomba offers. 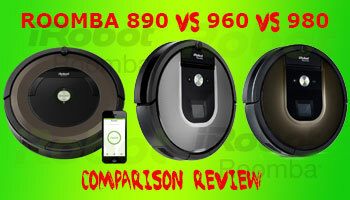 So without further ado, here the Roomba 890 vs 960 vs 980 comparison review. But before we dive deeper, a short overview of the three models. The 890 is an excellent choice if you are on a budget. It has 5x more suction power and has all the same features but sticks to the old iAdapt 1.0 If you have a small apartment, it’s a great deal! If you are looking for a medium range Roomba, I recommend the Roomba 890. It blends the old features as well as some new features inherent in the 900 Series models. If you have pets and carpets, this is a cleaner you’d want to own courtesy of the advanced motor that boasts more suction power. It also has Wi-Fi and a host of other top features that make it a true competitor of the 960 especially in terms of price. You can save more than $200 when you buy the Roomba 890 over the 960. But on the downside, the Roomba 890 has an old navigation system and will at times get stuck. Another thing, the 890 has a very short runtime. 60 minutes is not enough for a $500 robot cleaner and besides, it doesn’t resume cleaning after recharging. The 960 boasts the new iAdapt 2.0 VSLAM navigation. It’s only a clever choice if you don’t have a carpet. It has all the other features the Roomba 980 has save for ‘Carpet Boost’ and a longer runtime. This is the base model of the 900 Series and retails at around $600. What I like about it is the new navigation system, iAdapt 2,0 that competes with other top models like ECOVACS R95 and Dyson 360 Eye. It is very hard for this cleaner to get stuck and will take lesser time to clean. But then, it still packs the same old motor even though the power is boosted at least; you get 5x the air power in ordinary robot cleaners. The only notable addition is the extra runtime and most importantly, the auto-resume function – it will go back to cleaning once it recharges. This cleaner also has some shortcomings and the first one is the price. $600 is quite high considering it lacks Carpet Boost and has a short runtime too. But still, it’s a clever choice if you don’t have carpets. This is the ultimate robot vacuum cleaner. It boasts 10x more suction in ‘Carpet Boost’. Besides the new iAdapt 2.0, it also has a better runtime and a whole lot of new features. Unfortunately, it’s quite expensive. This is a very similar model to the 960 but has several additions that bring the price tag to around $900. But are the extras worth the $200? If you have a carpet, it is worth the amount because if Carpet Boost. Also, for those with large floors and apartments, the longer runtime may be something worth thinking about. That said, the Roomba 980 is the best option for those with carpets and large apartments, as well as pets; a true all-round cleaner! But then, the $900 price tag may be too high for many. Also, the Roomba 980 is quite noisy especially when in Carpet Boost. Now, it’s time we get deep into the details to see how these cleaners compare. To help you get the most out of this review, we have discussed the important aspects and features of these cleaner to help you make the best purchase decision. We will focus on the major factors that should be considered when buying robot vacuum cleaners and thereafter, compare the three to see which one is the winner in every area. While the aesthetics of a robot vacuum may not be of so much concern, the design is. This is because the design determines where the robot cleaner can reach and where it will not. That said, it is important to ascertain where there are any structural differences that may make any of the three Roombas better in any way. Roombas boast the same shape and design and the three, being the latest models share the same design and dimensions. They all have a 13.6-inch diameter and stands at 3.6-inches high. Regarding weight, the Roomba 980 is the heaviest at 8.7lbs. whereas the Roomba 890 and Roomba 960 weigh around 8.5lbs. Here, you can see the difference is negligible. But what I want to say is that iRobot should have made a shorter vacuum that will get under furniture and kickstands. At 3.6 inches high, there is a lot to be desired to make Roombas real low profile vacs. At least the likes of ECOVACS Deebot N79s and iLIFE V5s Pro, among many others average 3-inches high. Verdict – This is very hard to call because all the three vacuum cleaners have the same design and the finishing would mean nothing. That said, you’d want to dig deeper and find more. This is the most important consideration when buying any cleaner, not only robot vacuums. But then, what exactly determines the cleaning performance of these Roombas. We are going to look at the different aspects of cleaning and see how these three vacuums stack up against each other. Different homes have different cleaning needs so it’s important to know how these Roombas perform for each cleaning need so that you may pick one with the perfect combination. Here, we are going to dwell on four areas; floors, pet hair, carpets, and allergens. We tested the Roombas on hardwood, tile, vinyl, and carpet using some of the common household dirt; saw dust, cheerios, sugar, and of course pet hair. The Roombas offered quite some great performance on all the surfaces except on carpets. The Roomba 980 cleaned 95% of sugar, while the Roomba 960 and 890 cleaned like 85-90% – this is on a propylene carpet. The only explanation would be the fact that the 980 has Carpet Boost, a dedicated mode for carpets. So, what exactly happens in Carpet Boost mode? That will be our next subtopic. A vacuum works by suctioning the dirt and debris into the bin. That said, you want to buy the Roomba with the highest suction power to make sure all debris is vacuumed regardless of their size; from the smallest dirt like allergens to larger debris like cheerios. So, how do the Roomba square out here? I have used the Roomba 890 and even before digging deeper, I noticed that the two must be having the same motors. There was no difference in the suction power or even operation noise. Upon researching, you will find that the Roomba 960 uses the same old motor that’s used in the Roomba 890 hence the uniform results. Regarding noise levels, the Roomba 890 and 960 operate at an average of 60db but remember, there are times it may be louder or quieter depending on the condition of the cleaner. Typically, a Roomba that needs servicing or parts replacement will be louder because the motor is straining to supplement power to cover up for the inefficiency. On the other hand, the Roomba 980 boasts a new Gen 2 motor that has more power than the older 800 Series. Though the 890 and 960 deliver 5x more suction power than average botvacs, it’s the Roomba 980 that carries the day with a new motor that steps up suction power to 10x in Carpet Boost mode. But then, this comes at a cost – it’s so loud when in Carpet Boost and also, the battery drains faster. But then, I found the more suction power to be a nuisance when cleaning pet hair – it blows them away before the Roomba reaches them. The worst is when it blows them to places it may not reach. That said, I recommend the Roomba 890 or 960 if your main focus is floors and pet hair, but when it comes to carpets, stick to the Roomba 980. Roombas sweep and brush and having said that, it is important to see how the three compare when it comes to the brush system. Here, there is no much to say because the three Roombas have the same brush system. iRobot replaced the older tangle free dual multi-surface brush system with a new tangle free brush. If you have used a robot cleaner on pet hair, especially these long-haired breeds; Havanese, Chihuahua, and the rest, you know how frustrating it can be to constantly find your Roomba jammed because the brushes tangle up. This is a common problem with the Roomba 650 and Roomba 690. With the Roomba 890, 960 and 980, you don’t have to be afraid of tangling. To ensure your house has fresh breathable air, free from allergens, Roombas use filter systems and the good thing is, the three have the best filters. Also here, Roomba replaced the older HEPA style filters with the efficient true HEPA filters. 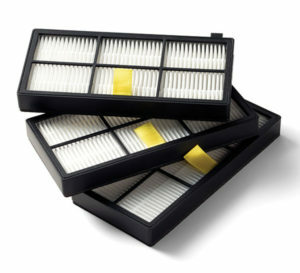 HEPA style filters are the best and will filter 99.97% of all airborne allergens up to 3 microns. On the other hand, cheaper models like Roomba 650 and Roomba 690 will filter around 85% – 90% of these allergens. With that in mind, you want to get any of the three Roombas if you have allergy. Besides, HEPA filters are essential for pet owners to filter out the allergy triggers like urine smell, skin flakes, and other pet and dander related allergens. This is a revolutionary technology that helps the Roomba detect where there is more dirt. It will then go to that place and switch to Spot mode for a thorough clean. Select Roombas have Dirt Detect and in the same token, there are two versions of this technology. The older robots like the Roomba 650 and 690 use Dirt Detect Series I while the new models, Roomba 890, 960 and 980 included, use Dirt Detect Series II. The difference between the two is the technology used. The former uses acoustic sensors only while the latter blends acoustic and optical sensors. I like how the three perform as far as dirt detection is concerned and just to note, the Series II will detect dirt from a far distance than Series I. Verdict – In terms of cleaning performance, the battle lines are drawn between the Roomba 890 and 960 vs Roomba 980. The 980 carries the day because of the extra suction power and Carpet Boost. But for those who don’t have carpets, I would rather go for the 890 because it is cheaper or the 960 because it has the new navigation system. But overall, the 980 is the best Roomba when it comes to cleaning performance. Roombas will move around your house by themselves. But just how do they know where to turn and where to reverse and take another route? And do all these Roombas navigate the same way or there is one that has a better navigation system? Can you mark areas where you don’t want the Roomba to reach? That’s what we are about to find out. The Roomba 890 has the older iAdapt 1.0 navigation that uses sensors to find its position in the house and also, to help it identify obstacles. Basically, this is the system that will determine where the Roomba will reach. Though it has a new upgraded software, the Roomba 890 has not been invincible in the 8 months I owned it. My living room was fairly crowded and time and again, I would find it stuck in corners or under the TV stand. But at least it is intelligent enough and won’t make some stupid turns like the Roomba 690 and 650. Apart from the crowded living room, it was able to clean all the other areas without any problem; from the corridors to the bedrooms and even the kitchen. On the other hand, the 900 Series boasts VSLAM navigation system that has also been adopted by ECOVACS R95, Dyson 360 Eye, and a few other models. This system is known as iAdapt 2.0 and uses sensors plus real-time optimal imaging for a more precise navigation. There is a camera at the top of the Roomba that literally takes images of your house and processes the data for better navigation, scanning, and mapping. I have had the Roomba 980 for 3 months now and not a single day have I found it stuck. It also takes a shorter time to clean because the approach is very methodical. It takes the most appropriate routes and the turns are very informed. But then, there is the concern of your security now that the Roomba takes images of your house and is connected to the internet. 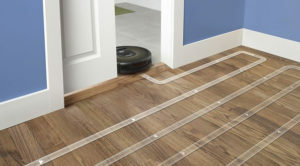 Actually, there were claims that the Roomba stores data and sells house plans to third parties, claims the CEO refuted. Another thing, the camera needs enough light to work efficiently. I also like the fact that it has Virtual Walls that I use to set up a boundary such that it won’t near my dining area. The dining room is one step down and I feared that it may once fail and fall over. Even though they all have Virtual Walls, the 900 Series is superior and has Virtual Walls + Lighthouses. The difference is, while Virtual Walls only blocks Roombas from accessing certain areas, Lighthouses block the other areas thus restricting the Roomba to cleaning one area. Verdict – Here, the Roomba 890 doesn’t stand a chance so that leaves the battle to Roomba 980 vs Roomba 960. Here, this is what I will tell you if you are keen on a Roomba for high-traffic rooms, nothing else, buy the Roomba 960 because it has the best navigation system, same as the pricey 980. But then, in terms of ranking, their navigation performance is the same. One of the most important things you should consider when buying a robot cleaner is the battery performance. 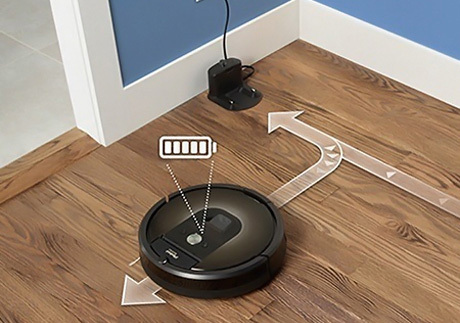 You don’t want to buy a robot with short runtime such that it won’t be finishing cleaning the house before it rushes to the charging base where it will spend like three hours? What if the visitors arrive when there is still cheerios and pet hair on the floor? The Roomba is not among the best brands when it comes to battery performance. Save for the 900 Series, the rest do a maximum of 60 minutes while cheaper brands like ECOVACS and ILIFE average 120 minutes. So, how do the Roomba 890, 960 and 980 compare when it comes to battery performance? All the 3 Roombas come with Lithium-Ion battery that lasts longer than Nickel Metal-Hydride though the latter store more current. But then, these batteries differ in capacity and consequently, the runtime is different. The 890 has a 1800mAh battery that can average it for an hour while the 960 has a 2130mAh battery that will last it for 75 minutes. It’s the Roomba 980 that carries the day courtesy of the 3000mAh battery that will push it for 120 minutes on average. It is imperative to note that not all times you will get the same performance. There are times the Roomba lasts longer while at times it may run for a shorter time. For example, the Roomba 980 will run for around 100 minutes when in ‘Carpet Boost’ mode and the explanation is clear; the motor uses more power. On carpets also, the battery tends to run for a shorter time and the thicker the carpet, the more power it will consume. Another time your battery will underperform is when the filters are worn out. This leads to inefficiency and the motor is forced to compensate for the deficiency thus increasing power consumption. One last thing to note, your Roomba’s battery performance will dip as time goes by. So, after 3 months, don’t be surprised when the 960 averages 60 minutes or the 980 does 75 minutes. When it comes to power management, the Roomba 890 is relegated leaving it a hard Roomba 980 vs 960 battle. While all the three Roombas have self-recharge, only the two latest Roombas, the 960 and 980, have auto resume function. This feature sends the cleaner back to where it had stopped so at no time will you find the floor dirty because the cleaner went to the charging station and didn’t resume thereafter. Verdict – If you want a Roomba with the best battery performance, I recommend the Roomba 980. It can run for a straight two hours and will resume cleaning after recharging. But then, it is very expensive and that gives the 960 a chance if you have a smaller apartment; yes it runs for a shorter time but then, it will recharge and resume cleaning itself. In short, at the end of the day, the job will be done. With the rise in Smart technology, more and more people are embracing Smart devices and now appliances. 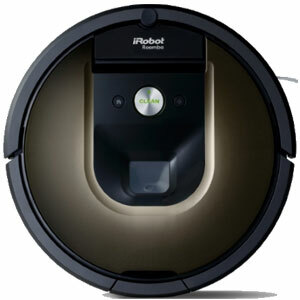 Roomba has been on the frontline in championing for a Smart Home with the Wi-Fi enabled vacuum cleaners. This feature allows homeowners to control their robots remotely via a Smartphone App or Smart Hub like Wink and also, voice assistants. The Roomba 890, Roomba 960 and Roomba 980 all have Wi-Fi and Smartphone App operation. Remember, even though these are Wi-Fi models, you can still use your Roomba even when you don’t have Wi-Fi. 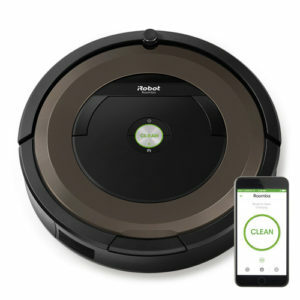 But to use the Smartphone App or Smart Hub, you will need to connect the Roomba to your home Wi-Fi. I know there are other robot vacuums with Wi-Fi but is there something special about Roombas? 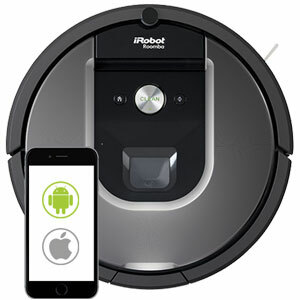 Roomba gives you the power to do more on the Smartphone App. I was able to give the Roomba commands right from my App while in the office. I would program it, tell it to clean, send it to home base and so on and as long as the Wi-Fi was stable, it obliged. But then, to get the best Smart experience, ensure you have a reliable internet connection. Your routers should also be well positioned to minimize dead spots now that the Roomba is less than 4 ft. from the floor. Actually, I would recommend you get a Wi-Fi mesh network system like Linksys Velop or Netgear Orbi – they ensure 100% network coverage. But the icing on the cake is the Clean Maps reports that tell you exactly where the Roomba reached and where it didn’t reach. This feature is in the 960 and 980 models only. When it comes to voice control, also all of the three have the same specifications. They are compatible with Amazon Alexa and Google Home Assistant. I tried out the Roomba with Amazon Alexa and the results were amazing. No need for remotes or Smartphone Apps, you just tell the Roomba to start cleaning and it will do just that. Unfortunately, I didn’t try it with Assistant but I am 100% sure they are compatible. Verdict – Here, the battle remains between the Roomba 980 vs 960 because they have extras. I like the Roomba 960 because it has Clean Maps but then, the 980 carries the day courtesy of the Clean Maps and additional cleaning settings. But at the end of the day, these are features you will hardly use so don’t put too much focus here. The bottom-line is, they all have Wi-Fi and are compatible with voice control – there’s nothing more you’d want! The Roomba 890 sounds a great deal because you will get it for under $500. What I like about it is the fact that it shares several features with the much expensive 960. The only additions in the Roomba 960 are longer runtime, auto-resume, and the new VSLAM navigation system. 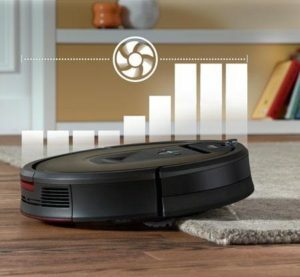 So, if you have high traffic rooms, you should not mind spending a little more for a vacuum that maps out your house using sensors and visual localization, that Roomba is the 960. If you also have a large apartment, say a two bedroom and above, you should opt for the Roomba 960 over the Roomba 890 because iAdapt 2.0, besides the precise navigation, it is more intelligent and will clean the floor faster as it approaches a methodical cleaning pattern. On the other hand, when it comes to the Roomba 980 vs 960, I would choose the Roomba 980 anytime. That is if I am comfortable with the $900 budget. But what exactly will you be paying the $200 for? The first thing is Carpet Boost; a feature that is activated when the Roomba 980 is on carpets for a deeper clean. So, if you have a carpet floor, this is a treason why you should buy spend the extra $200. 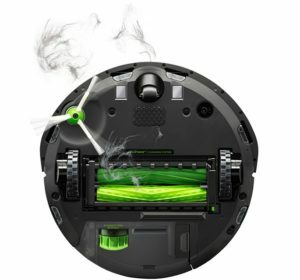 The Roomba 980 also has a longer runtime and advanced cleaning settings. If you are torn in between the two, here’s a heads up. Do you have a carpet floor? If yes, then get the Roomba 980 but if you don’t have a carpet, and you are not a fan of one, get the Roomba 960 and save $200 that you can spend on a robot mop like the Braava and forget all your floor cleaning problems.